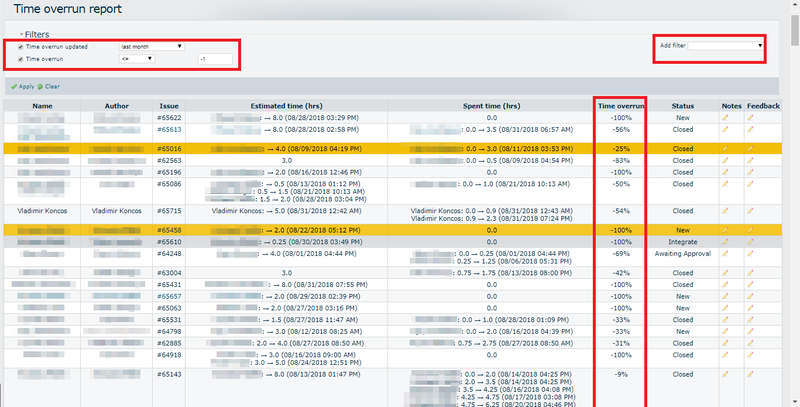 This document introduces a new feature in VNCproject: a live report for controlling time overrun in a project. Time overrun of a ticket will be accrued if more time has been spent than estimated. As a part of ticket and timesheet controllling, the controler always creates a monthly report on all tickets with time overrun in project. Time overrun updated = „this month“: The system will show a report only for those where estimation/spent time have been updated in the current month. The user may change this filter according to his/her need. This filter is mandatory. If this filter is not selected, no record will be shown. Time overrun ≥ 21: As we just want to see the ticket with time overrun more than 20%, this is why this filter is applied by default. The user can change this filter according to his/her needs. 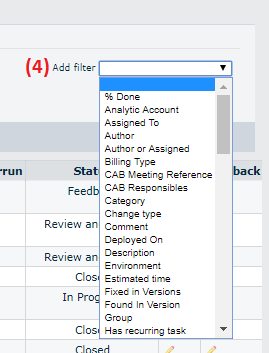 We can use „Add filter“ (4): to add more filters as „Author“, „Assigned to“, „Updated“, „% Done“ etc. If no more filters were chosen, the system shows only the two default filters. 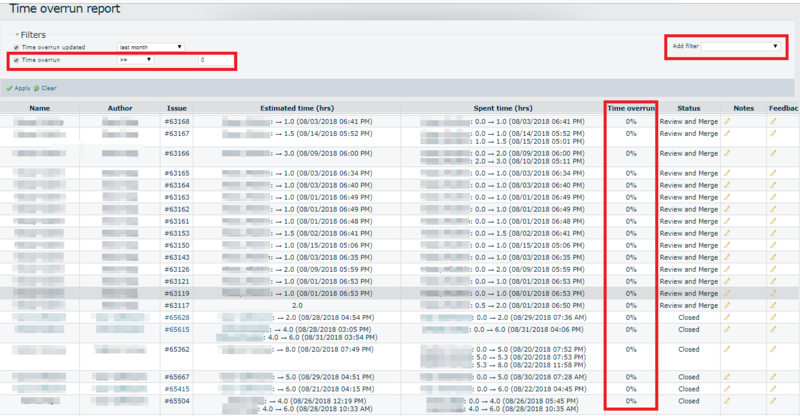 After we click the button „Apply“, the following columns and their values will be displayed by default (5): Name, Author, Issues No., Estimated time (hrs. ), Spent time (hrs.) with the last updated details,Time overrun (in %),Status, Notes and Feedback. The system will record any change in estimation or spent time on the ticket. Date and time of each change will be shown in the bracket. If there are multiple users working on a ticket, every update of each user will be recorded separately. Another feature of the report: in the two columns „Notes“ and „Feedback“, which are mentioned inline for each time overrun, the controller or the project manager can add/ edit infos and comments directly at any time. Ticket number and the name of the user can be linked directly to VNCproject. A new permission is added to "View time overrun report". Users can only see reports, where they are permitted for. We can download the report at any time as PDF and CSV file (6). This part introduces a report on all tickets with changes of initial time, based on the platform of "time overrun report". We can see all changes of „estimated time“ and „spent time“ at all tickets (which are updated for example last month). To see the result for one person, we can add more filters like „Author“, „Assigned to“. This report shows us any time changed of each person (1) and also all team members in each ticket (2). The report will show all tickets with „spent time“ less than „estimated time“ and also all tickets, which only EAT is booked (-100%). We can use this report e.g. for a bonus program.